Sculptor of companies, products and relationships. Joe Chiarella has been involved in enterprise IT and tech startups for the last 35 years. He has performed or managed almost every role in a traditional IT organization. Following years in “big-corp” traditional IT, Joe became a founder or co-founder in several software startups, including raising equity funding and strategic planning to execute to exist. Joe has been primarily responsible for products, as well as data centers, DBAs, developers and more. His interest have turned towards business execution in general and the intersection of people, business strategy and products. To quote Joe, “I have become as interested in relationship building and company building as I am in product building.” He actively supports the entrepreneurial community in Central PA.
Joe Chiarella: Part nature, part nurture; or part accident, part intention. Even as a child, I was always “inventing” things. So, I think creating products is naturally wired into me. But being a product creator doesn’t necessarily make me an entrepreneur. In fact, over the years I’ve learned that the “product builder” person is often not the best choice to be the “company builder” – and that includes me! By nurture, I grew up with a father that worked in sales in a large company. I tried the big corp thing myself for about a decade. It just wasn’t for me. Perhaps I was impatient, but it seemed to take too long to get things done. So that too is probably nature. The nurture part is one of circumstance. I firmly believe that our circumstances help to make us who we are. Growth-oriented people choose their circumstances so that they will grow in some direction they want to grow. So, while I was on the fast track at a Fortune 500 company, I chose to leave. I left to pursue, full-time, the commercialization of a patent I had been awarded. While that product ultimately did not succeed, the process taught me that I loved doing entrepreneurial things. I was growing in a thousand ways (translation: I was making a LOT of mistakes from which I was learning) and a thousand times faster than I ever would have in corporate America. It was exciting! At present, with Colloid, LLC, we are trying to commercialize two issued patents in the area of data encryption. The vision there is simple, but very difficult to accomplish. The algorithm and technology we have developed (www.UberCrypt.com) could represent a paradigm shift in data security by enabling the mass customization of encryption. That’s not been done before. There have been two major shifts in modern encryption in the last 40+ years. Both shifts took over a decade to get traction and did so long before certain government and academic institutions managed to gain control over this industry. So, this vision is well over the horizon and speculative. That said, we have some exciting things coming for Amazon’s AWS platform soon. Stay tuned! In another company (www.PatentIdx.com), I am using patent data analytics to oil the commerce between patent law firms and their clients, and to support economic development efforts in major US metros. In a non-profit offshoot of that venture (www.InventivenessIndex.com) – I’m trying to use that same data analytics engine to look deeply into the connection between invention and economic development with the hope of teasing out correlatives that could be used to accelerate startup ecosystems. I am also using that platform to illuminate things like the role that gender plays in the inventor community. My vision for these two adventures is ultimately the same – to enhance tech-ecosystems by bringing a particular corpus of data to bear. Right corpus? Wrong corpus? Don’t know. But it’s a place to start. My vision for the future of “my community”? I’ve lived in south central PA for most of my life. I’ve been civically active for pretty much all of that time – even all the way back to high school. It’s important to me to contribute to the greater good. Though I’ve lived here, business has taken me a lot of other places from which I have learned much. Those travels have taught me that this region suffers from a number of ailments that slow our growth. Like all ailments, they cannot be cured until we first recognize they exist. So, the first part of my vision for this community (which I define as Harrisburg, Lancaster, York, Carlisle and even up to State College) involves a solid reality-check. Then, I believe we have some powerful resources (both public and private) that, if well-activated and collaboration-focused, can usher in a new era of opportunity for the region. In fact, I think that Catamaran is just such a resource and I want to encourage you all in it. I also think that Harrisburg University, Penn State Middletown and at the Hershey Medical Center and particularly the Hershey Center for Applied Research, of course Ben Franklin Technology Partners, the Technology Council of Central PA – particularly through UpNextFest, the fine work of Anne Kirby through the Candy Factory in Lancaster, the new venture capital fund 1855 Capital, programs like ExecuStar which helps to develop existing entrepreneurial executives, and most recently the interest the region has drawn from Steve Case and Rise of the Rest – as well as a growing list of “tech activists,” tech meetups, even efforts like CoderKids which fills a void in not only encouraging elementary school students in learning how to code – but actually teaches them how, and much, much more. Too many to all list here in fact. But all of which point to a growing critical mass that – well harnessed – could usher a new era of cooperation and growth. There isn’t a single biggest challenge. I’ve been a part of creating and growing seven new ventures, and an intimate observer to a few dozen others. Not all of these were local. Each challenge is unique. Sometimes it is the product. Other times, the management team. Or bad timing. Or a sub-optimal corporate and/or capital structure. On and on. That said there are a few things I see in the local region that tend toward fatal factors. The greatest of these is risk-aversion. There is a pretty pronounced culture here of not wanting to take risks. That can prevent the creation of companies. On the other hand, if you can somehow manage to get the company launched… this region also boasts a tremendous, and I do mean tremendous, “iterative, disciplined, and methodical” kind of work ethic. That has given rise to certain kinds of global companies like AMP, Armstrong, The Hershey Company and more. Great companies! So, if we can somehow shift our regional culture-of-thinking from “taking ANY risk = failure” and “failure = scarlet letter” to “taking NO risks = stagnation” and “taking SMART risks = growth and opportunities” and “failure = badge of honor” – we can start to move the community forward. So, the key there is to let go over some risk-aversion and take “smart risks.” For that to happen, we need to do a better job of engaging entrepreneurs who have had prior successes. And/or we need to “import” a few. I’m a fan of both approaches, but lean more today toward the latter than the former. IMHO, we need some new thinkers to catalyze new thinking. Einstein once said “We can’t solve problems by using the same kind of thinking we used when creating them.” Changing cultures of think is hard. It takes new thinkers. I would say “When the world tells you your idea or your execution won’t work – listen, but keep driving. Tenacity is your friend!” and I would also say “When someone experienced tells you your idea or execution won’t work – listen, and heed their advice – and save yourself a lot of time, money and pain. Tenacity is your enemy!” You might say “But those things are in contradiction.” I would say they are not. Sometimes the first maxim is correct, and sometimes the second. Judgment is knowing when to apply which to your current circumstance. And the only way you gain that judgment – is by doing. (which is my real advice to my former self – or anyone just considering starting something) And by being willing to learn from your mistakes. It’s like in tennis, the only way you learn when the ball coming at you (or the one you hit) is going out of bounds before it does, is by playing enough tennis to judge the ball in motion. So, PLAY! You’ll win some, you’ll lose some. It’s ok. Just learn from all of it. Hmmmmm. I guess I would have to say that my biggest surprise and lesson learned is that – are you ready – I can be wrong. ;-) Yep, I can be wrong. You knew that already didn’t you!? ☺ Part of what makes any entrepreneur successful is confidence and, often but not always, being that “Type A” personality. It’s ok to be both. But just because you are sure of something doesn’t mean you’re right about it. Validate the idea externally. Keep a certain amount of healthy-skepticism/humility about yourself (and humor) and you will learn more and faster and that, over time, will tilt the right/wrong scale more in your favor. But make no mistake about it – or rather DO make mistakes - you’ll make more mistakes than not. Just admit them. 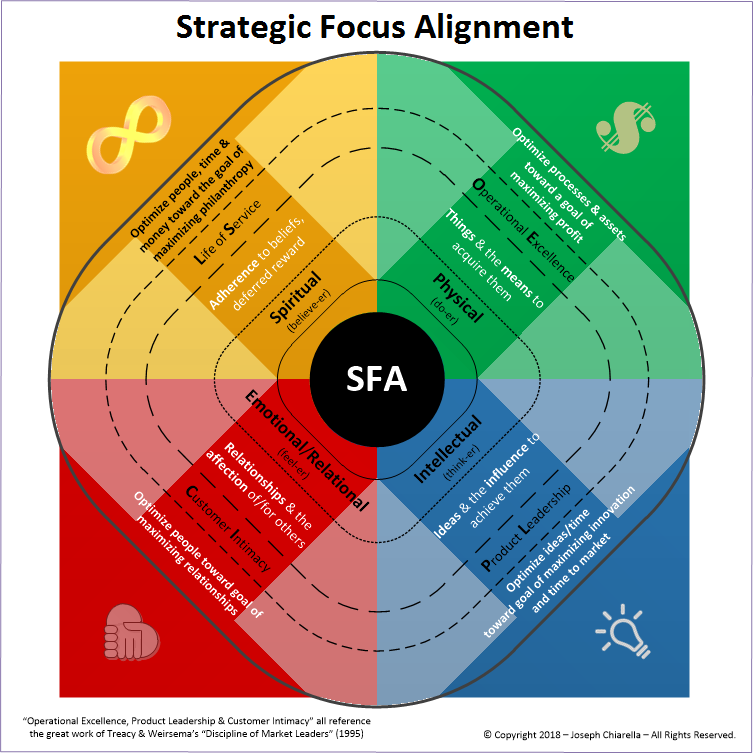 Over the last 20 years or so I’ve been developing and refining a management/business model I call Strategic Focus Alignment (SFA) which has two central theses. The first thesis of SFA is that businesses – particularly when run by the founder(s) – share their DNA with their founder(s). One strongly imprints on the other. The other thesis is that we, as humans, have four basic “drivers” in some ranked order that define how we would naturally operate as people – and thus also our businesses. Therefore, understanding ourselves vis-à-vis these four natures and how those natures translate into our business (using the Discipline of Market Leaders model by Treacy and Wiersema) – is the work of SFA. It is my hope that my legacy is one of helping others understand and leverage that knowledge for themselves, their business and, longer-term, their communities. Joe Chiarella has been involved in enterprise IT and tech startups for the last 35 years.